La Brigade de la Grande Table dans les locaux de France Culture. De gauche à droite : (debout) Tobie Nathan, Pascal Ory, Gérard Mordillat, Mathieu Potte-Bonneville, Fabienne Servan-Schreiber, Antonio A. Casilli, Caroline Broué, Dominique Cardon, (assis) Christophe Prochasson, André Gunthert, Raphaël Bourgois. La première séance de mon séminaire EHESS Étudier les cultures du numérique : approches théoriques et empiriques pour cette année universitaire a eu lieu le mardi 20 novembre 2012 à l’EHESS. Merci à tou(te)s les participant(e)s pour leur présence, leurs commentaires et leur enthousiasme. Voilà les slides de ma présentation. The French translation of this essay is available on OWNI (part 1 and part 2), as installments of my column Addicted To Bad Ideas. With the new academic year kicking in, my colleagues and I have decided to add a little wiki twist to a couple of courses we teach at Telecom ParisTech. I started a Wikispace for my digital culture class, and with Isabelle Garron and Valérie Beaudouin we’ve made compulsory for first year students to try and edit and discuss at least one Wikipedia page, as part of their initiation to online writing. Sure, Wikipedia has been used as teaching tool in academia for some years now, to say nothing about its increasing popularity as a research topic. But the main rationale for using it in the classroom is that it has become the one-stop-shop for bibliographical research and fact-checking. Think about your own online information habits. What do you do when you don’t know the first thing about a given topic? You probably google it, and the first occurrence is most likely a page from Jimbo Wales’s brainchild. You do it, we do it, our students do it. 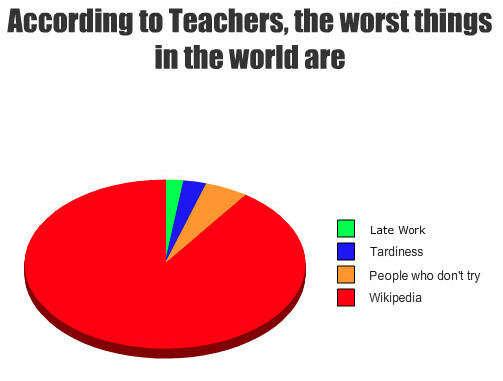 So we have to incorporate Wikipedia in our academic activity, not because it’s a cool gadget, but because otherwise it will create a dangerous blind spot. And yet, admitting to this without panicking is not simple. At least here in continental Europe, ill informed judgments about the allegedly poor quality of Wikipedia articles are still commonplace in higher education. Some – like the French high-school teacher Loys Bonod, who had his 15 minutes of fame earlier this year – go as far as to add false and misleading information to Wikipedia, just to demonstrate to their students that it… contains false and misleading information. Such paradoxical reactions are a case in point. Wikipedia is just as accurate and insightful as its contributions. Hence, the need to encourage its users to relinquish their passive stance and participate, by writing about and discussing relevant topics. Of course, one might say, when it comes to Wikipedia the Internet iron law of 90–9–1 participation applies: for 90 simple readers of any article, there will be only 9 who will make the effort to click on the “modify” tab to actually write something in it, and maybe just 1 motivated enough to click on the “discussion” tab and start a dialogue with other wikipedians. Social scientists can come up with many explanations for this situation. The claims about the dawn of online participatory culture might have been largely exaggerated. Or maybe the encyclopaedic form tends to recreate cultural dynamics that are more coherent with an “author vs. reader” dichotomy than with many-to-many communication. Or maybe Wikipedia editors tend to intimidate other users in an effort to increase their own social status by implementing specific barriers to entry. Try starting a new article. In all probability, its relevance will be challenged by some editor. Try starting the biography of a living public figure. Chances are that a discussion will ensue, focussing not on the public figure in question, but on the private qualities of the biographer. Is the author just an IP-based anonymous, or a legit logged-in user with a recognized contribution track record? These days, the House of Commons has been debating an amendment to the British Defamation Bill specificially designed to tackle Internet trolls. Now website owners and internet access providers will be forced to reveal the IP and personal information of users identified as authors of ‘vile messages’. It is business as usual: whenever some ICT-related news story catches the public eye, British policy makers come up with an ad hoc law. Preferably, one mindlessly disregarding privacy and free speech. 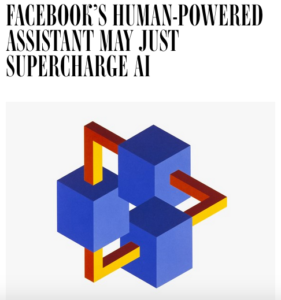 In a remarkable effort to lull the general public in a false sense of understanding digital cultures, The Guardian has devoted a special session of its June 12, 2012 edition to this peculiar online phenomenon. 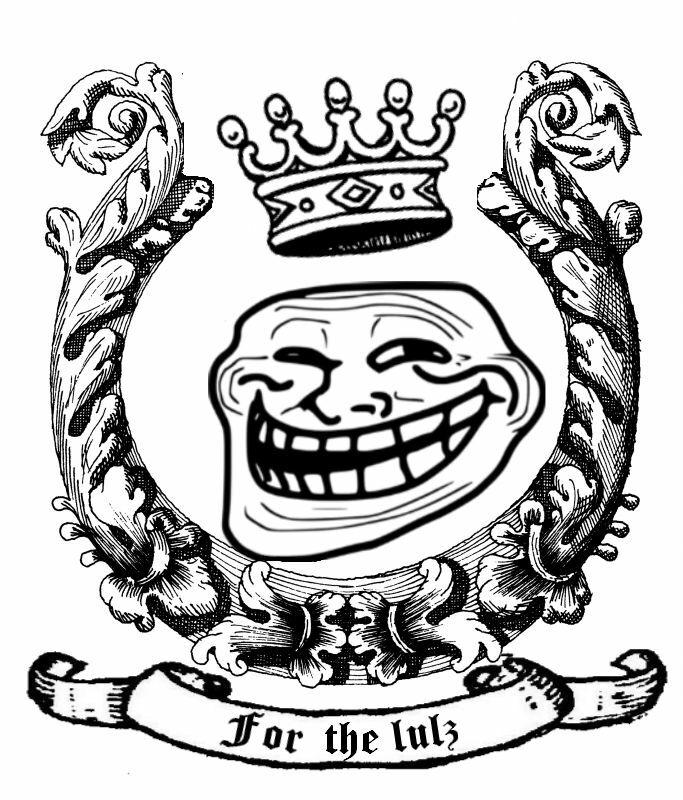 The pièce de résistance is Zoe Williams’s What is an internet troll?. An article concocted using the usual troll news story recipe: one part pyschology professor delivering highbrow quotes about the ‘disinhibition effect’ of electronic media, one part journalist whining about today’s diminishing education standards and pervasive hate speech, two parts sad anecdotes about some celebrities we’re supposed to sympathize with. The conclusion of this tone-setting essay (“We shouldn’t call them ‘trolls’. We should call them rude people.”) is probably best rendered when pronounced with a high-pitched monty pythonesque voice, like in The Life of Brian‘s “He’s not the Messiah. He’s a very naughty boy!”. 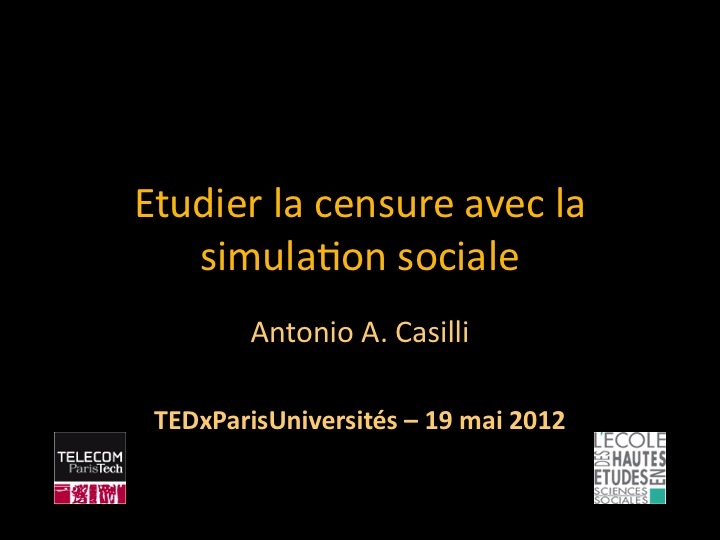 Le samedi 19 mai j’ai été parmi les heureux conférenciers de l’édition 2012 de TEDxParisUniversités. A cette occasion, j’ai pu présenter au public français les résultats du projet ICCU (Internet Censorship and Civil Unrest) que je mène avec Paola Tubaro, enseignante-chercheuse à l’Université de Greenwich, Londres. L’accueil a été plus que chaleureux : la tweeterie m’a porté en triomphe, j’ai reçu les accolades des organisateurs et je me suis imbibé de l’enthousiasme d’étudiants et de militants de tout bord. J’exagère, mais pas tant que ça (suffit de lire le compte-rendu Storify concocté par Gayané Adourian ;). Voici donc le texte et les slides de mon intervention, en attendant la vidéo. 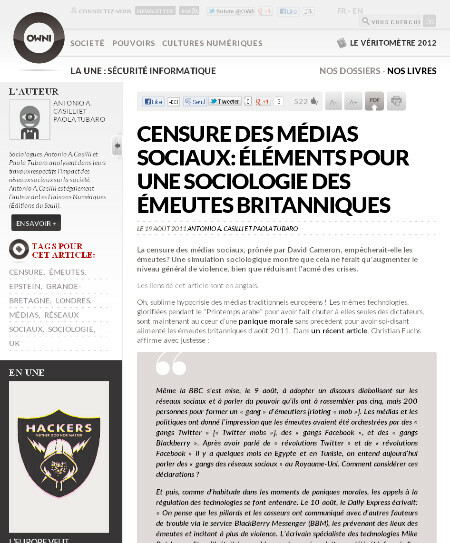 Aujourd’hui je vais vous parler des effets négatifs de la censure des médias sociaux, en passant par le cas des émeutes britanniques de 2011. In this post, you’ll find some background information about my ongoing research on internet censorship – mainly in collaboration with Paola Tubaro (University of Greenwich, UK) and other colleagues. Our focus is on unintended and negative effects of censorship, based on analyses of social media use conducted in the last few years. In my latest book Les liaisons numériques. Vers une nouvelle sociabilité? [Digital Relationships. Towards a New Sociability?, Paris, Seuil, 2010] I dealt with the topic of pro-ana (short for “pro-anorexia”) and pro-mia (“pro-bulimia”) websites, blogs and forums of persons with eating disorders. The most controversial among them have gone as far as to claim that eating disorders are a choice or a lifestyle, rather than conditions. A grant from the French National Research Agency (ANR) allowed me and my colleagues to lauch ANAMIA, a large-scale study on eating disorder-oriented online communities. Since the early 2000s, fears that these websites may induce unhealthy behaviours (possibly in young and adolescent viewers), have prompted many web services to remove them, while some countries have considered outlawing them. Yet eating-disorder related Web communities continue to proliferate. They have migrated to more hidden platforms, barred entry to outsiders, concealed their true nature, and relocated in foreign countries. In a previous post published on Bodyspacesociety blog, I have dubbed this the “toothpaste tube effect“: squeezed from one service, controversial contents re-group elsewhere. Paradoxically, censorship multiplies these websites – if only because of the urge to duplicate contents for backup purposes, in case they have to shut down and move! Today, these websites are less open and less visible, though still numerous and densely connected with one another. Thus, they can still influence their users, just as before; but it has become harder for health and nutrition campaigns to locate them and reach out to their users. Our results indicate that Internet censorship is ineffective and inefficient: it has failed to stop “negative” influences, and has made it more difficult for “positive” influences to operate. I know I should be in Lyon for the www12 conference with all the Internet big shots, but instead I’m taking a plane and heading to Greece. 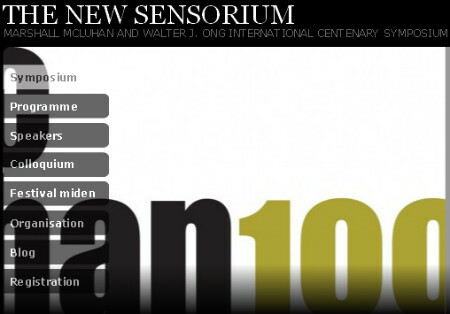 The opportunity came via an invitation to deliver a speech at the New Sensorium, an international symposium that will take place on April 20-21 at the BIOS, in Athens. If you are around, you should definitely attend! The conference deals with some of my main research foci (digital technologies, media and the body) and it is the outcome of a collaboration between the Department of Communication, Media and Culture of Panteion University and the McLuhan Program at the University of Toronto (I was their guest a few months ago). 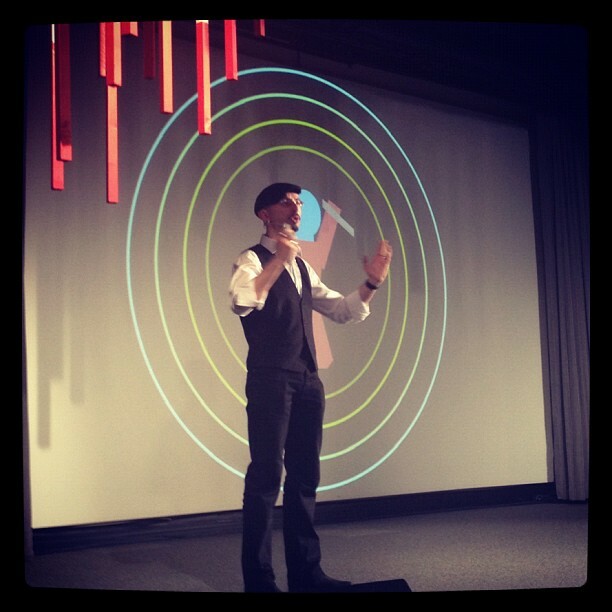 Just so you know my speech carries the somewhat cryptic title The Virus and the Avatar. Ways of socializing the sensible in computer culture – and if you don’t have a clue of what it’s about, here are two texts in Greek and in English that might be of help. But this Athens trip will also be the chance to do more than a bit of field research for our ongoing ICCU (Internet Censorship and Civil Unrest) project. You might remember the project was kickstarted by this blog post about last year’s UK riots. Our research received a lot of attention and eventually became a working paper, then an article coming up in the Bulletin of Sociological Methodology and started a number of prospective spin-offs in other nations. The Athens one is based on the idea of studying media and internet use during the Greek 2010-12 protests (and the way they are linked with the 2008 riots). Won’t go into details because I don’t want to spoil the party. But, if I manage to grasp a little wifi, I might be blogging a postcard or two from my Athenian fieldwork.